← Wordless Wednesday: When There Was Only Two…. Below is a story from the BBC News. Being a long time Star Trek fan (yes I’m a Trekkie) I found this idea both exciting and a little scary. The technology to beam a customer’s information in subtitles on to your retina is not only creepy but a true “George Orwell’s 1984” nightmare come true. I don’t want my private information rolling across the screen of a strangers eyeballs. Sales Associates are already Borg like enough as it is (aka Freckles) without actually looking like one. But I can see the benefit of using it as a language translator. I wouldn’t mind having one for that purpose even if it makes me look like a Borg. Think how easy traveling in foreign countries would be with no more language barriers. This could be a giant step forward in making the earth a smaller friendlier place. A place like Gene Roddenberry dreamed of. “A place to boldly go where no one has gone before” sorry couldn’t resist. This is also not far, far into the future but now. They expect to have these glasses on the market in early 2010 and the translator version in early 2011, that is just right around the corner. I just looked at the date I wrote, 2010. Do you have any idea what that looks like to me. It is a shock every time I see it. I am a child of the 1950’s and 60’s. I read a lot of science fiction growing up and saw every sci-fi movie made. The idea of “2010” was science fiction to my generation. It blows my mind that I am alive in this technologically advanced century and at the same time pisses me off that we don’t have flying cars like in “The Jetsons.” Don’t expect to own a pair of these glasses any time soon though because the cost is pretty high like with all new electronic technology. Do you think Trekkies will still be watching Star Trek movies in the 23rd century and will they be relevant or seem like an old silent movie does today, out of touch. Just a thought. Resembling glasses but lacking lenses, the headset uses a tiny projector to display images on a user’s retina. NEC said it planned a version that used real-time translation to provide subtitles for a conversation between people lacking a common language. The firm said the gadget, dubbed Tele Scouter, was intended for sales people or employees dealing with inquiries from customers. NEC said the Tele Scouter was intended to be a business tool that could aid sales staff who would have information about a client’s buying history beamed into their eye during a conversation. But, it said, it could also be put to a more exotic use as a translation aid. In this scenario the microphone on the headset picks up the voices of both people in a conversation, pipes it through translation software and voice-to-text systems and then sends the translation back to the headset. At the same time as a user hears a translation, they would also get text subtitles beamed onto the retina. “You can keep the conversation flowing,” NEC spokesman Takayuki Omino told AFP at a Tokyo trade show where the device was unveiled. Mr Omino said the system could also be used for confidential talks that would be compromised by the use of a human translator. 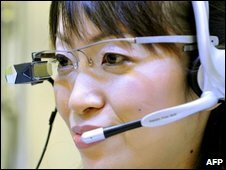 NEC said the Tele Scouter would be launched in Japan in November, 2010 but would initially lack the translation feature. A version that can provide subtitles would follow in 2011, it said. When it goes on sale, a batch of 30 headsets will cost about 7.5m yen (£50,000). The cost does not include the price of the translation tools and software. This entry was posted in Friday Soapbox and tagged bbc news, blog, blogs, futuristic glasses, gene roddenberry, general rants, hot topics, humor, life, love, mom blogs, moms, motherhood, movies, my life, news, opinions, parenthood, passions, passions and soapboxes, photos, sci-fi, science fiction, star trek, technology, trekkies, wordpress, writing. Bookmark the permalink. 4 Responses to Friday Soapbox: “Resistance Is Futile”…. Like all sci-fi, creepy and cool at the same time. And seriously, where are the flying cars and the jet packs? This is wild! And speaking of being shocked that we’re soon to be writing 2010 on our checks (that is, if you still use checks anymore) I remember sitting in school trying to figure out how old I’d be in the year 2000 and thinking wow! 36 is sooooo old! And it’s funny that you mention the whole “no flying cars” bone. My husband often goes on about that and he just wrote a blog questioning where the robots are and why he’s still stuck raking leaves. Imagine if we’re still around to witness it when those two things happen?